Nature abhors cliffs as a general rule. Gravity dictates that cliffs will be a rarity in most parts of the world, because most rocks are simply not capable of resisting the intense stresses the cliffs cause. 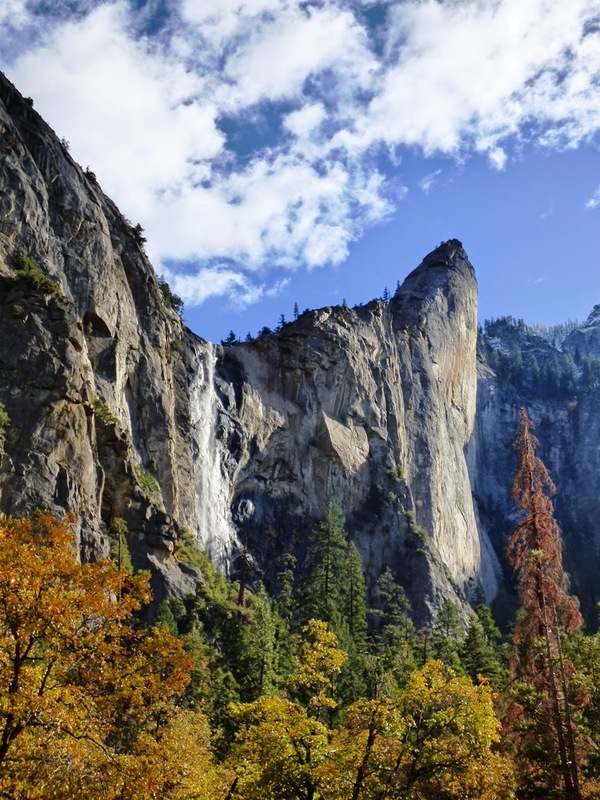 The cliffs of Yosemite are thus extraordinary, because they are among the highest in the world. 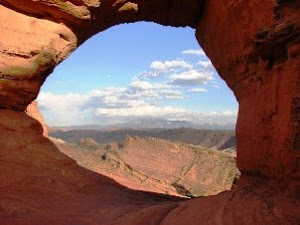 The reason, of course, is because they are composed of extraordinary rock. The subterranean world beneath an active volcano is a place from which the imagery of hell has been drawn. Seething hot magma pulses upwards through the crust, invading every crack and fissure, wedging rocks apart, and occasionally breaking through and producing catastrophic volcanic eruptions. But eventually the volcanic system becomes inactive, and the magma chambers eventually, and slowly, cool down. The silicate-based chemical stew starts to crystallize, and the interlocking crystals produce extremely strong rocks with names like granite, diorite, tonalite, and granodiorite. The rocks vary by (and are defined by) the percentages of quartz, plagioclase feldspar and orthoclase feldspar. Other accessory minerals, the dark ones like hornblende or biotite mica, give the resulting rock the characteristic speckled appearance. In a general way, the granite is lighter in overall appearance while the others are somewhat darker. These are the kinds of rocks that can stand in high vertical cliffs. But other things have to happen to make cliffs. Normal river erosion tends to produce slopes, not sheer cliffs. Yosemite Valley was once a deep river-cut canyon, but the slopes would have been unremarkable, steeply sloping, but probably covered with talus (rocky debris) and vegetation. 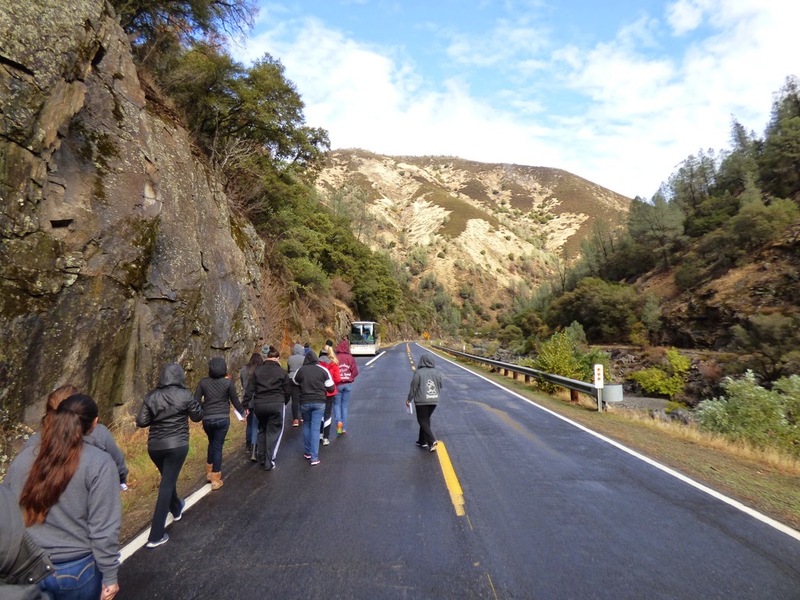 The lower Merced River canyon (below) provides a hint of how it might have looked: deep and rugged, but not the sheer cliffs of Yosemite. One of the factors is ice. 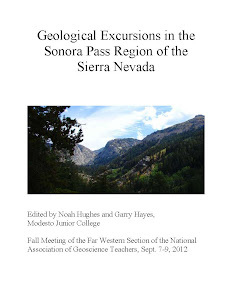 Conditions in the Sierra Nevada changed starting about two million years ago. The climate worldwide went through a series of cooling periods, and ice sheets covered much of North America and Europe. The climate would warm up again, the ice would recede, and then cooling would return. Perhaps a dozen ice ages took place, the most recent ending only around 12,000 years ago. The ice did not cover the entire Sierra Nevada, nor did it cover the tops of the high peaks along the crest. The glaciers were confined for the most part to the valley floors, where the ice plucked boulders and abraded surfaces, eventually producing U-shaped valleys. 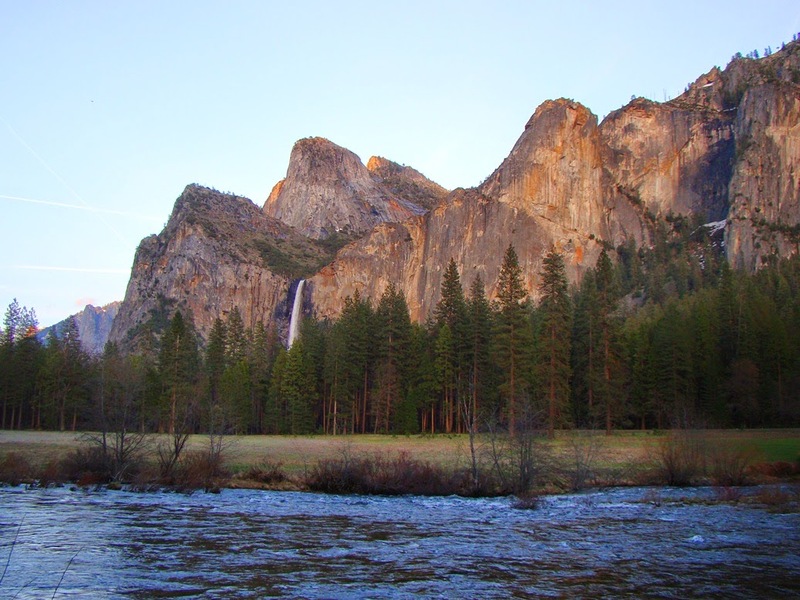 There is direct evidence of at least three glacial episodes that scoured Yosemite Valley, the Pre-Tahoe (somewhere around 800,000 to 1 million years ago), the Tahoe (several pulses between about 160,000-65,000 years ago), and the Tioga (about 13,000-20,000 years ago). And yet ice needs some help when attacking such hard rock. There have to be fractures and fissures for the ice to exploit before serious quarrying can take place. And that is where jointing and exfoliation come into the picture. 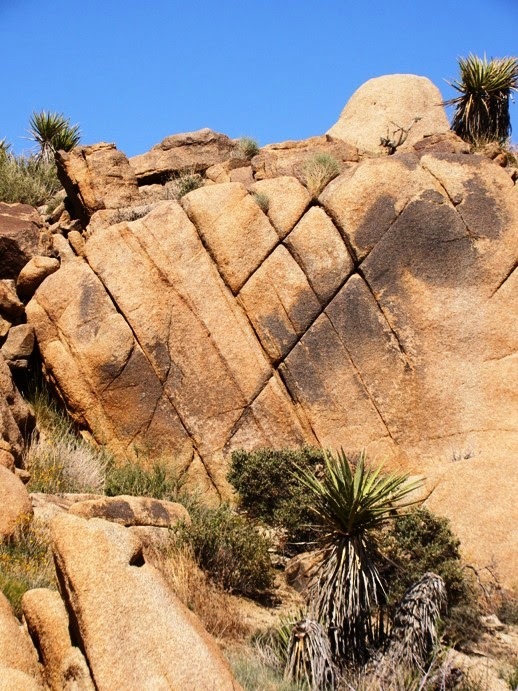 Granitic rocks cool at depths of several miles within the crust. Pressure is high at such depths, and so as the rocks are lifted towards the surface and exposed by erosion, they expand and fracture. Fractures that occur parallel to the surface are called exfoliation sheets. More or less vertical fractures, which may form from subtle extensional or compressional forces, are called joints. Joint sets can form in several directions as seen in the images above and below. Closely jointed rocks are readily excavated by glaciers, while more widely jointed rocks are not. 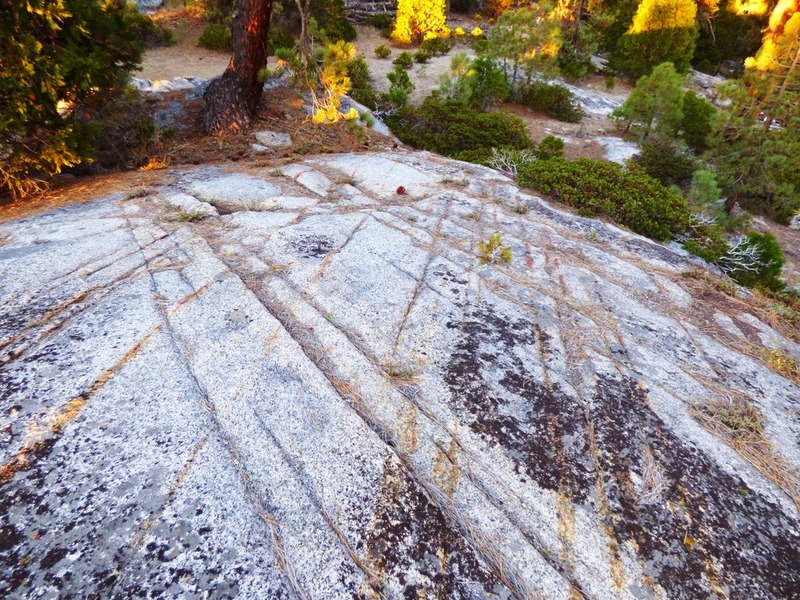 Yosemite Valley, with ten different intrusions of granitic rock, exhibits wide variation in susceptibility to erosion, so that some units tend to form recessed slopes (i.e. the Diorite of the Rockslides), while other rocks tend to form bold cliffs such as El Capitan (the El Capitan granite). I'm back from my first Yosemite trips in a number of months, so I would like to share a couple of cliffs with you in the next couple of posts! I was going to call this mini-series "If These Walls Could Talk", but a short search revealed that naturalists at Yosemite are already using that title! So, I've modified it just a bit. The cliff of the day is the one that extends from Bridalveil Fall to the Leaning Tower. 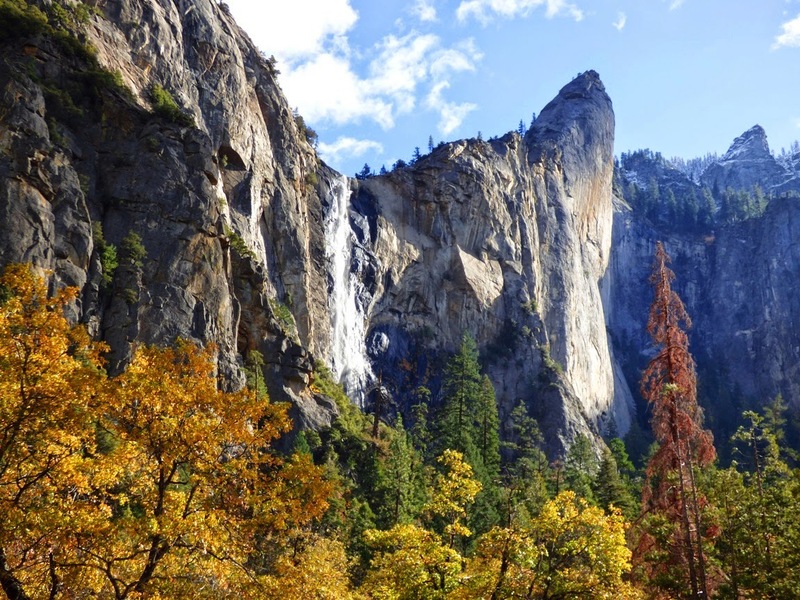 Bridalveil Fall is a classic example of a glacial hanging valley that formed when the main Merced glacier cut a deeper valley than the smaller tributary glacier in Bridalveil Creek. The waterfall drops 620 feet, and runs pretty much all year, though in the autumn it is often just a trickle, as can be seen in the top photo of this post. In the spring runoff, the fall is spectacular. 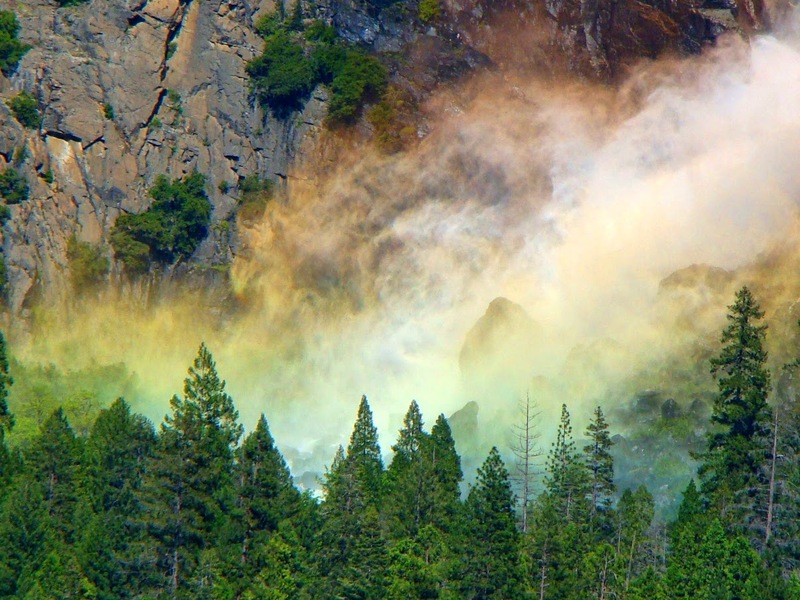 A couple of years back, in the blissful pre-drought days, I caught a rainbow in the spray coming of the base of the fall. The Leaning Tower is composed of several kinds of rock, including the El Capitan granite and the Leaning Tower granodiorite. The granite is about 103 million years old, and the granodiorite somewhat younger, although a precise age hasn't been determined that I can find. The most remarkable feature of the Leaning Tower is...it leans! The cliff prominently hangs out over the valley below. El Capitan does this as well, but it isn't so easily seen. The cliff is one of the more popular climbs in the valley. 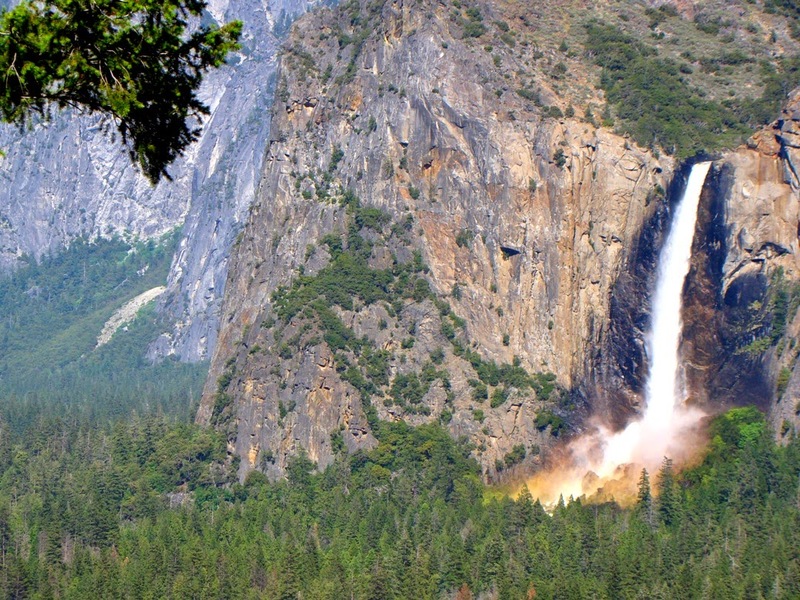 Next post: what's on the other side of Bridalveil Falls?